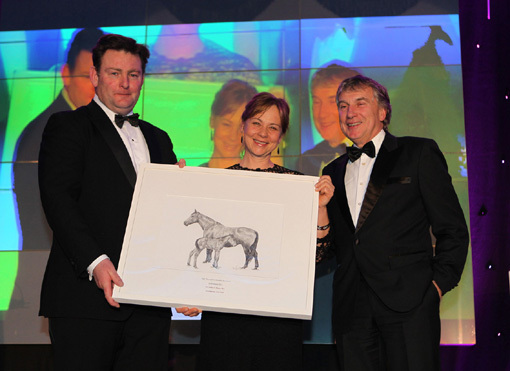 Pat Downes, Manager of the Aga Khan Studs in Ireland presents us with our painting. What a great start to 2012 - long may it continue! We learnt to our great joy that we were chosen to be the recipients of this year\'s Small Breeder Award. 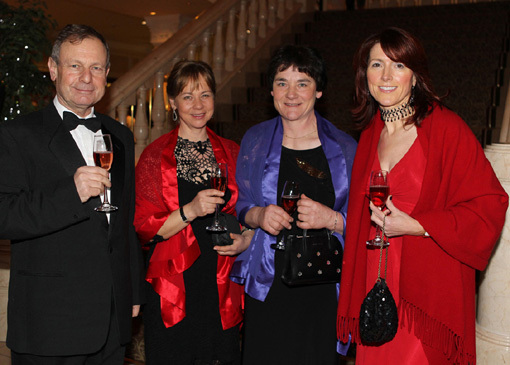 Every year the Irish Thoroughbred Breeder\'s Association hosts an award presentation evening. 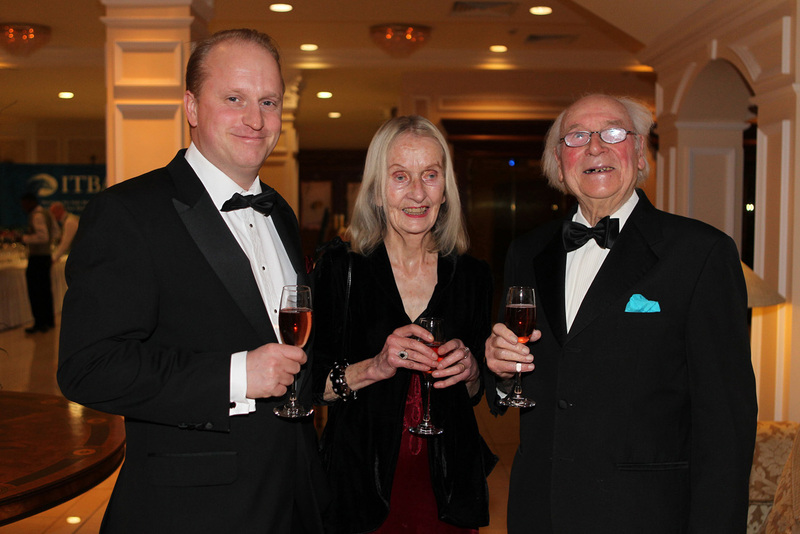 This is a beautifully organised black tie event and this year it was held at the Heritage Hotel in Killenard. The purpose of the Awards are to recognise and celebrate achievements of Irish Breeders during the previous racing year. It covers a series of both Flat and National Hunt categories as well as a Lifetime Achievement Award and an Induction into the Hall of Fame. The former was presented to Frank Barry, renowned agent and master of Manister House Stud, breeder of La Collina, winner of the Moyglare Stud Stakes for 2yo fillies. This talented Strategic Prince filly is owned by our good friends Joerg and Diana Vasicek and trained by Kevin Prendergast. Dennis Brosnan, the founder of the Kerrygold Group and head of Horseracing Ireland was inducted into the Hall of Fame. 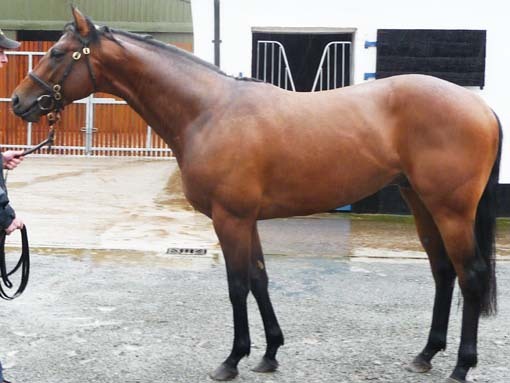 Mr Brosnan also owns the famous Croom House Stud who bought Lilbourne from us as a foal. A great night was had by all and memories will remain. We would like to thank the ITBA for the perfect organisation of this event, the selection committee for considering us a worthy winner of this award and Caroline Norris, who provided all those lovely photographs. 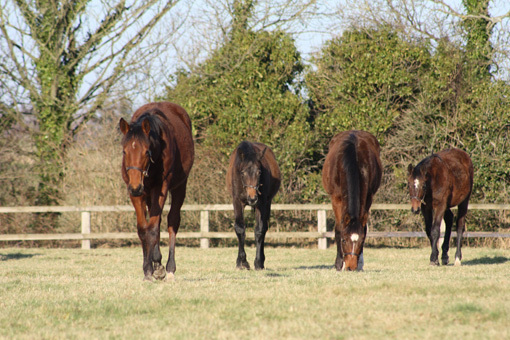 The Yearlings enjoying their freedom in the field. However, the focus is the February Sales which are now only two weeks away. The yearlings are busy with their walking excerice in the morning but still enjoying their day out in the field. They are now coming in at night and will get groomed from the end of the week until Sales time. We also found time to visit that handsome stallion Lilbourne Lad at Rathbarry Stud!